Vincent Gallo (Tetro, Buffalo '66) stars as a Middle-Eastern insurgent captured by US forces and transported to a secret detention centre somewhere in Europe. When the vehicle he is riding in crashes, he escapes into a snowy wilderness, a world away from the desert home he previously knew. Forced into extreme survival mode and pursued by an army that does not officially exist, he must confront the necessity to kill in order to survive. 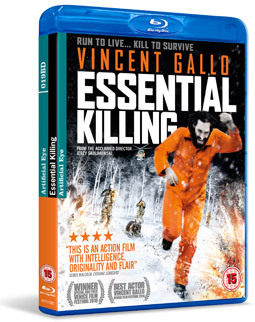 Essential Killing is a provocative examination of the modes of modern warfare and the limits of human endurance, this rivetting thriller from veteran filmmaker Jerzy Skolimowski (Deep End, The Shout) is anchored by an extraordin ary performance from Vincent Gallo. Winner of Best Actor (Gallo) and Best Film at the 2010 Mar del Plata Film Festival, and the Volpi Cup Best Actor prize and the Grand Special Jury Prize at the Venice Film Festival the same year, it was described by Eye for Film as "a highly politicised work, unapologetically adopting the perspective of an Islamic insurgent forced to fight for survival on a quest of almost Biblical proportions," Essential Killing will be released on UK DVD and Blu-ray by Artificial Eye on 11th July 2011 at the RRP of £15.99 for the DVD and £19.99 for the Blu-ray. Though it seems unlikely that an Artificial Eye disc would have no extra features, none have as yet been confirmed. We'll update this story when we know for sure.